DL: As I understand it, the album is constructed from a series of pieces roughly five minutes long. There were two pieces recorded with spinet, two with objects and two with piano, and these are overlapped in a kind of chain fashion. We start with the first spinet piece on its own, which is then followed by the same piece played simultaneously with the second spinet piece. Then the second spinet piece is juxtaposed with the first object piece, and so on until we end with the second piano piece on its own. Have I got that right? It's a very elegant and original structure – what made you decide to work this way? And have you used a similar methodology in the past? CS: Some years ago I wrote a small piece for voices in this structure. But there everything was written out. When thinking about a solo project I came to the same idea again, but this time the elements were improvised pieces. Well, more or less improvised – I decided on a length of five minutes beforehand. I wanted something that could only be realised in the form of a recording, but which at the same time included improvisation. A recorded improvisation is as fixed (or even more fixed) as a written piece. I wanted to work with this fact by using every element (the five-minute pieces) twice, so that it’s exactly the same, but occurs in a changing surrounding. The chain provides an evolution throughout the whole piece. It is in fact a canon – thus a very old form. Besides the formal questions I was interested in using different instruments, not just the spinet. I have anyway a variety of objects/preparations that I use with the spinet, but I’ve also started to work with pick-ups and microphones and amplification. Last year's project was to combine those new elements with the spinet, but here I did the opposite and separated the material, arranging a set of objects and amplification as an extra instrument. The third instrument is the piano – which is a comeback, because I used to play piano before I changed completely to the spinet. I tried to find a way of using the piano without "playing" it, I mean not pianistically, using the piano tones more as found objects. The juxtaposition of the pieces helps to bring those elements into close relation. DL: That's fascinating. When I first listened to the album I didn't look at the titles or watch the tracks going by, so I heard it as one long piece, which seemed somehow delightfully endless – I could almost imagine it continuing forever. I think this is related to the way you use silence on the record. In fact, if you replaced the first and last tracks with a single track consisting of "spinet1" and "piano2" played simultaneously, the form would become cyclical and could indeed continue cycling for ever. I wonder what your thoughts are about the sense of direction within this music, or alternatively the lack thereof? CS: Indeed I tried to achieve something where you lose orientation as a listener, in order to concentrate on the moment, and the sounds themselves. Then there is the repeating of the pieces (the elements), so that there is also the moment of memory, which interferes with the orientation. The structure of five-minute-pieces (as "variation") is also a form of repetition. A repetitive structure can create a field, or at least a field-perception. The silences inside the single pieces react somehow with the silences between the pieces, and funnily enough, connect them instead of separating them. But the main reason for the silences is that I wanted to provide space for other elements (of the juxtaposed piece) to have a formal influence. You are right, "spinet1" and "piano2" might be played simultaneously, and I have thought of this too. But for me it was important to begin with one "solo" piece; I wanted to have this building-up of the structure, and a "solo" at the end is the consequence. It is a cycling form – as a canon always is. In a canon you can’t say where the beginning or the end is from the entry of the second voice on. The compositional aspect of this work lies in the conception of sounds placed in a field. Although I didn’t make a score, I tried to play as if there was an empty screen or sheet where I place my sounds. I'm doing this as well when I improvise freely, but in free improv there is usually also the aspect of development, and often this aspect comes to the foreground. Here in this piece time is mainly felt as space, open to all directions, and less as time as a result of a process of uncovering material. So the events just come and go, and of course the image of them perhaps coming back is obvious. The canon supports the perception of sounds like in a mobile. DL: It seems to me that you really do need to know how the album is structured to enjoy it fully. Do you have any thoughts on listening informed by structural (one could say compositional) knowledge, versus "just listening to the sounds", if such a thing is possible? CS: Probably you're right. But it’s not possible for me to listen to my own work in an uninformed way, so it's a bit difficult to say. I had a lot of joy working on the conception. Of course I hope that it isn’t necessary to have knowledge of the structure in order to enjoy it. There’s a lot of material and structures that could just as well occur in a "simple" improvisation, and I put in a good deal of work and input at this level. Knowledge about structure is a different shift, so to say; it adds to the first "uninformed" experience and makes the whole thing more complex and thus richer. As I said before, the reason for the structure is to support or suggest a way of listening – and if it were necessary therefore to know the structure intellectually, then it would not be a good composition. I think that you always find more joy in listening to a piece of music when you know something about its concept. In some music this is more important and in other music less. But knowing nothing will always be less rich - at least as long as the knowing doesn’t lead to prejudices. DL: I completely agree with you – you put it very beautifully. One last question: the album strikingly demonstrates how different one sound seems to be when it is or is not accompanied by another sound. The title of the CD is Variations but the structure seems as much about juxtaposition as it is about variation. What do you think is being varied in this music? CS: Variation is (before Webern) a repetitive, cyclic form. You go over the same thing again and again, looking at it from a new angle every time; that's what I wanted to emphasize with the title. Of course juxtaposition is also an important part of the structure, I agree. In fact it’s not so easy to say what is varied, besides the obvious. It is certainly not the first piece; it doesn’t stand as a "theme"; it’s already a variation! Maybe one could say: when you’ve listened to all the pieces, you might get a suspicion of what is being varied. “Stuttgart-born spinet player Christoph Schiller has appeared on three previous Another Timbre releases, improvising in two intimate duos and a trio, in the company of musicians including saxophonist Michel Doneda and trumpeter Birgit Ulher. Variations differs considerably from those albums, for Schiller is the only musician featured on here and as well as spinet and amplified objects he also plays piano, his original instrument. The album's seven tracks entitled Variation 1 to 7 may raise expectations that Schiller is starting with a "theme" and then improvising variations upon it... but nothing could be further from the truth. In fact, those seven tracks are closely related to each other but not in such a conventional way. To construct the tracks, Shiller improvised six separate parts— two on spinet, two on objects and two on piano—each lasting approximately five-minutes. In typical fashion, each of the six parts has frequent silences or quieter passages. "Variation 1" consists of the first spinet part alone, while "Variation 2" adds the second spinet part alongside the first one and "Variation 3" matches the second spinet part with the first objects part and so on (check the track listing and all becomes clear...) Consequently, each of the six parts is heard twice, on two consecutive tracks. “Depuis quelques années, pas mal de disques sont sortis avec Christoph Schiller, souvent en duo ou en trio, et toujours crédité à cet étrange instrument : l'épinette, une sorte d'ancêtre du clavecin. Il a souvent eu tendance à se confondre volontairement aux instrumentistes qui l'environnait, et ça pouvait parfois être frustrant. C'est avec plaisir du coup que j'ai appris la sortie de ce premier solo, l'occasion de se plonger dans cet instrument inhabituel. C'est ce que je pensais avant de l'avoir écouté en tout cas. Mais en fait, ça ne marche pas tellement, car Schiller utilise son épinette de manière très abstraite. Il l'utilise de la même manière que Coluccino utilise ses objets trouvés - comme une source sonore et rien d'autres, pas question d'entendre les cordes pincées. Schiller utilise d'ailleurs de nombreux objets non musicaux, métalliques souvent, posés sur l'épinette, seuls ou avec un piano, il utilise aussi un piano seul - mais que l'épinette ou le piano soit joués seuls, préparés, ou que seuls les objets soient utilisés, il est bien difficile de les distinguer. Il n'y a que du son pur, un long continuum interrompu seulement par des silences. Pourtant, ce n'est pas la forme qui manque. Schiller a en effet bien pris soin de diviser ce disque en plusieurs parties articulées en fonction des instruments utilisés : épinette, épinette avec objets, objets, piano avec objets, piano. Des pièces symétriques qui s'articulent en fonction de leur sources sonores, mais qui ne se distinguent pourtant pas les unes des autres. Sa musique est plutôt envoutante et inhabituelle, on distingue parfois des sortes de notes, des sources instrumentales, mais qui sont noyées dans les préparations et les techniques étendues. Du son pur et innovant jaillit à tout bout de champ et forme des sortes de vers sonores collés les uns aux autres, sans oublier une part non-négligeable de silence. 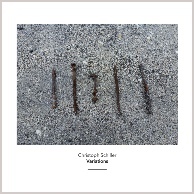 “This latest recording from Swiss composer/instrumentalist Christoph Schiller consists of an assemblage of seven improvisations for spinet, piano and amplified objects. The seven individual pieces function as constituent parts of a kind of canon, or linked sequence, of overlapping voices, each voice consisting in a sound source. Schiller recorded two improvisations each on spinet, objects and piano, respectively, and then layered them in order to create a suite of thickening and thinning sounds and textures.